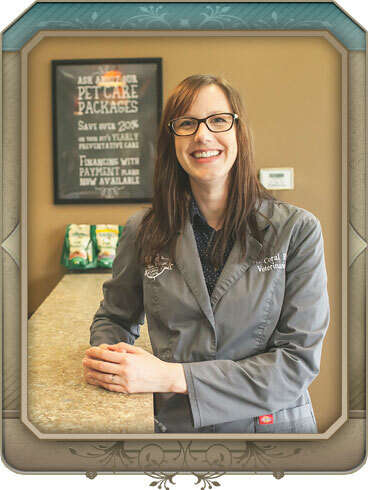 Coral Riggs is the founding veterinarian and owner of North Paws Veterinary Clinic. Growing up on a hobby farm in Hastings, Minnesota, Dr. Riggs was inspired to pursue a career helping animals at an early age. She attended the University of Wisconsin River Falls, graduating with honors in 2006. She attended Ross University School of Veterinary Medicine, earning her Doctorate of Veterinary Medicine in 2011. She is a member of the American Veterinary Medical Association and her professional interests include soft tissue surgery, dentistry, preventative medicine and general animal care. While in veterinary school Dr. Riggs' first patient was a one-pound Yorkshire terrier infected with parvovirus, a potentially deadly viral infection. "For one week I monitored, treated and revived this poor pup until finally she recovered," she says. "I lost a lot of sleep and gained a lot of stress over that tiny little fur-ball, but it was worth the reward of a wagging tail and a patient with an ambitious appetite for food and snuggles. After that experience, how could I say no to veterinary medicine?" Dr. Riggs has three dogs: Rossi, a 12 year old lab mix; Steve, a 6 year old dachshund; and Jules, a 2 year old Pembroke Welsh Corgi. She also has a 26 year old Arabian horse called Wildfire. In her free time Dr. Riggs also enjoys biking, hiking, horseback riding, interior design, sewing, baking and walking her dogs. Dr. Riggs' husband Matt is a software engineer and provides technical support for North Paws Veterinary Clinic's computers. Since graduation Dr. Boero has worked at small animal practices throughout the Twin Cities. She is excited to be a part of the North Paws team! Pets are family and her goal is to form a trusted bond with her clients in order to provide the best medical care for them. Her interests include preventative medicine, feline medicine, chronic pain management, and dermatology. She currently resides in Minneapolis with her four cats Harley, Gabby, Mr Pants and Gary as well as her greyhound Jax. In her free time she enjoys gardening, reading, traveling and planning her next adventure.